This short, intensive workshop concentrated on the implementation of and experimentation with specific construction methods using a parametric design process in combination with a custom built CNC installation. This design and production process aimed to impact the way computer-aided manufacturing is used in real life construction processes by using a low-cost hardware setup and highly efficient use of raw materials, offering CNC solutions with much greater efficiency than the standard CNC milling. The student teams explored design methods based on an architectural case study, following the material and spatial characteristics of the specific construction method and its components, developing both the digital design and interpretation methodologies as well as the physical prototyping process. 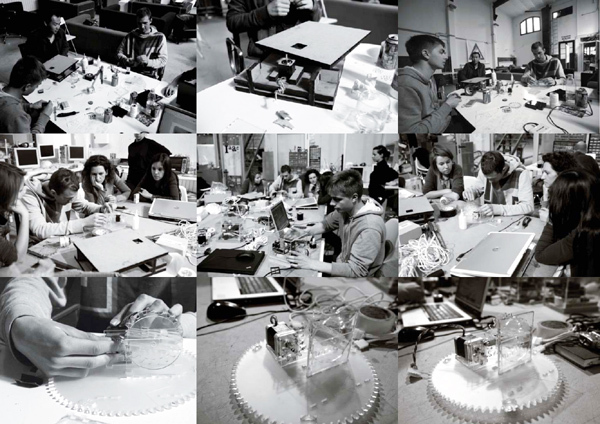 For this exploration, each group studied possibilities and feedback of all parts of the design to production process such as digital design, modelling, scripting, file translation, hardware interface and machine operation, component fabrication and system assembly. Results of the workshop included a custom-built CNC installation and 1:1 scale prototypical output produced with the machine.